The size of untapped labor reserves is a critical factor in estimating the potential for faster economic growth. The share of the workforce who hold multiple jobs provides a neglected perspective on the size of labor reserves. The latest data on multiple job holders suggest that significant untapped labor reserves do still exist despite low headline unemployment rates. The Office of Management and Budget is due to release tax and spending plans for the 2018 fiscal year soon. As reported recently by the Wall Street Journal, the plans are expected to be based on relatively optimistic growth forecasts of 3 to 3.5 percent per year, well above consensus estimates. The debate over the realism of the budget plan will turn, to a significant degree, on whether there are a sufficient reserves of untapped labor to support higher growth rates. The following chart shows that the share of all workers holding multiple jobs has a cyclical pattern that lags the business cycle. The multiple job rate did not reach its maximum until March 2009, 16 months after the official business cycle peak, and did not reach its cyclical low point until a full five years after the June 2009 trough of the recession. 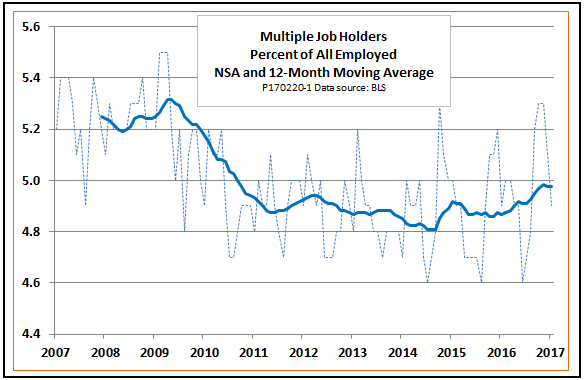 The BLS publishes multiple job data without seasonal adjustment. To highlight the cyclical trend, I have emphasized the twelve-month moving average, while showing monthly data as a dotted line. The multiple job rate has recovered since 2014, but it remains well below its pre-recession value. Returning the rate to its pre-recession value of 5.3 percent would mean the addition of approximately 450,000 jobs, not an insignificant number. We get further insight into this untapped reserve of labor if we look separately at workers who have a full-time job plus one or more part-time jobs (FT-PT), and those who have more than one part-time job, but no full-time job (PT-PT). As the next chart shows, the cyclical component of the multiple job rate over the last business cycle has been due entirely to its FT-PT component. In contrast, the share of PT-PT workers among all workers increased rapidly during the recession and then continued to rise throughout the recovery. There are about twice as many FT-PT workers as PT-PT. For a clear comparison of the trends, this chart rebases all three multiple job series by setting their value in January 2007 equal to 100. It is likely that the upward trend in PT-PT work has a structural explanation. Some observers have argued that employer mandates of the Affordable Care Act have induced some employers to cut workers' hours to avoid the need to provide health insurance. Others have disputed that, seeing no sharp increase in part-time workers. Part of the reason for the difference of opinion may be due to paying inadequate attention to the distinction between part-time workers and part-time jobs. The Bureau of Labor Statistics counts anyone who works fewer than 35 hours a week as a part-time worker. It considers a person with two part-time jobs totaling 35 or more hours a week to be a full time worker. In principle, the upward trend in people with multiple part-time jobs, which in many cases would total 35 hours or more per week, could be caused by the ACA without showing up in separately reported data for part-time employment. 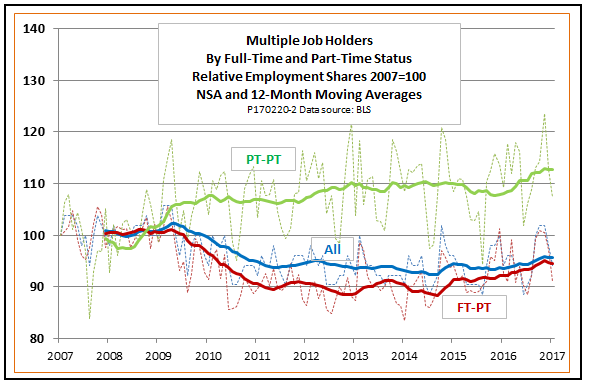 If it is true that the ACA has increased the number of part-time jobs, then the PT-PT rate shown in the chart could begin to decrease if healthcare laws are reformed. If so, the untapped pool of labor represented by the multiple job data could be even larger than suggested by the purely cyclical component of the multiple job series.